French physician and deputy; born May 5, 1839, at Paris; son of Leopold Javal. Emile studied both medicine and mineralogy (M.D. 1868); he devoted himself specially to ophthalmology, and invented an ingenious method for the diagnosis of astigmatism. He became one of the leading authorities on strabismus; and in 1877 he was appointed director of the ophthalmological laboratory of the Sorbonne. 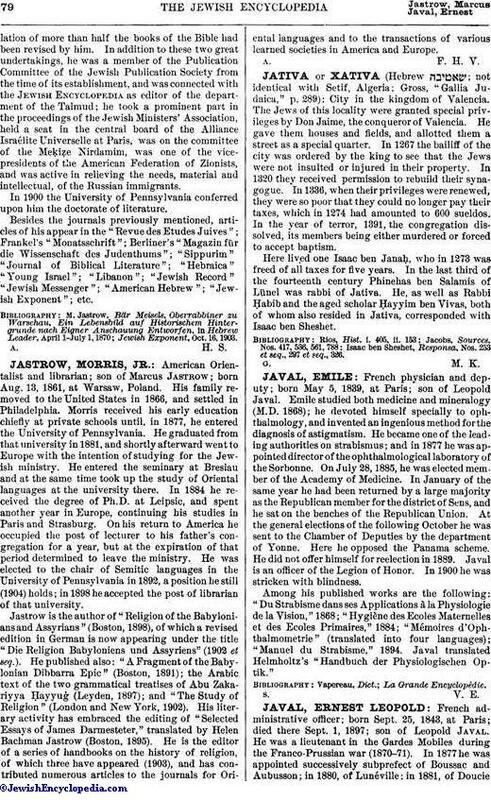 On July 28, 1885, he was elected member of the Academy of Medicine. In January of the same year he had been returned by a large majority as the Republican member for the district of Sens, and he sat on the benches of the Republican Union. At the general elections of the following October he was sent to the Chamber of Deputies by the department of Yonne. Here he opposed the Panama scheme. He did not offer himself for reelection in 1889. Javal is an officer of the Legion of Honor. In 1900 he was stricken with blindness. Among his published works are the following: "Du Strabisme dans ses Applications à la Physiologie de la Vision," 1868; "Hygiène des Ecoles Maternelles et des Ecoles Primaires," 1884; "Mémoires d'Ophthalmometrie" (translated into four languages); "Manuel du Strabisme," 1894. Javal translated Helmholtz's "Handbuch der Physiologischen Optik."